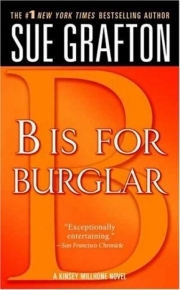 In the second installment of the "Alphabet Mysteries", private investigator Kinsey Millhone is hired by Beverly Danziger to locate her missing sister, Elaine Boldt, whose name is needed on some paperwork regarding an inheritance. Elaine was last seen getting into a cab with the intention of flying down to Boca Raton, Florida, where she spends her winters, but appears to have disappeared along the way. It seems a relatively straightforward matter, so much so that Kinsey is not sure Beverly needs a PI, but she agrees to take the case. 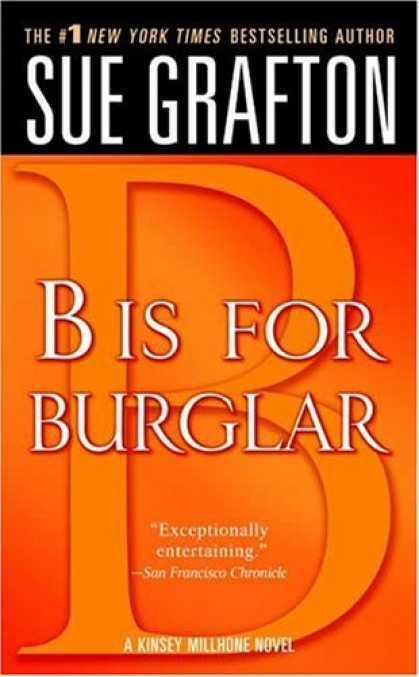 Things are not as easy as they seem however, as Kinsey can find no trace of Elaine anywhere in Florida, although she does find a woman called Pat Usher, who claims Elaine agreed to let her sublet the Boca Raton apartment where Elaine lived while she was off travelling. This claim rings false to Kinsey, since no one but Pat Usher has received a postcard from Elaine on her supposed trip, so she secures the able detective assistance of Elaine's elderly neighbour, Julia, to keep an eye on things in Florida while she goes back to California. Kinsey suspects there is a link between Elaine's disappearance and the death of her Santa Teresa neighbour, Marty Grice, who was apparently killed by burglars who then set fire to the Grice home a week before Elaine left. Someone breaks into the home of Elaine's Santa Teresa apartment supervisor, Tilly, apparently on the track of some bills of Elaine's which Tilly was holding ready to forward on to her. Someone also searches Kinsey's apartment, and Kinsey realises it is Elaine's passport which the thief is after. Gravely concerned for Elaine's safety, Kinsey suggests to Beverly that Elaine's disappearance should be reported to the police, but Beverly objects so violently that Kinsey terminates their relationship and starts working for Julia instead. Kinsey reports the disappearnce and meets Jonah Robb, a recently-separated cop working on missing persons - but despite her attraction to him she is reluctant to get involved. A visit from Beverly's husband, Aubrey, complicates matters further, as it turns out he was having an affair with Elaine, which Beverly had discovered, and Kinsey begins to wonder if Beverly herself could have had a hand in Elaine's disappearance. Kinsey becomes increasingly convinced that Elaine is dead, and that Pat Usher is involved. Pat has now disappeared, after totally trashing the Boca Raton apartment. Eventually, she discovers that Pat Usher has applied for a driving licence in Elaine's name, thus proving Pat's involvement. Marty's nephew Mike, a teenage drug dealer, confesses that he was at the Grice home the night of the murder, and from the discrepancy in times between his account and what was told to the police, Kinsey realises that it was Elaine who died in the Grice fire, not Marty. Marty and her husband killed Elaine to steal her identity and her money. They then passed Elaine's dead body off as Marty's by switching the dental records. Marty departed for Florida as Elaine, and arrived as Pat Usher, with some cosmetic surgery to help. Having been unable to find Elaine's passport, she and her husband have been forced to wait for a new one to come through before they can skip the country. Kinsey returns to the Grice home to look for the murder weapon, but while she is there, the Grices find her. Kinsey is shot in the left arm during the fight that ensues, but she manages to detain the two criminals, and calls for help. Whole or part of the information contained in this card come from the Wikipedia article ""B" Is for Burglar", licensed under CC-BY-SA full list of contributors here.